The program became a yearly event. As word of the program spread so did the opportunities to be ambassadors grow. Tom's and Becky's have participated in parades not only locally, but nationally as well. They have made appearances in California, Washington, D.C., Florida, New York, Minnesota, Iowa, Kentucky, Pennsylvania, Texas, Arizona, Kansas, Ohio, Tennessee, Illinois and of course the state of Missouri over the years. They have visited Japan (twice), Canada (twice), and Mexico. They have made appearances at schools, libraries, ground breaking ceremonies, conventions, tour buses, ribbon cuttings, festivals, riverboat dockings, local functions, civic groups, state fairs, county fairs, etc. 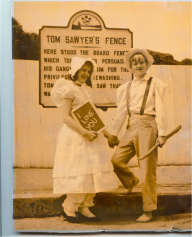 During the summer on Friday and Saturday you can see Tom and Becky strolling in the Mark Twain Historic District. They have greeted presidents, vice presidents, first ladies, and governors. They have had their pictures in magazines and newspapers around the world. They have been in movies, travel films, and on TV news programs throughout the United States. Each year Tom and Becky travel to locations such as the Calaveras County, California and Hartord, Connecticut to promote Hannibal and keep Mark Twain's characters alive. In 2015, stewardship of the Tom and Becky Program was transferred to the Mark Twain Boyhood Home and Museum.